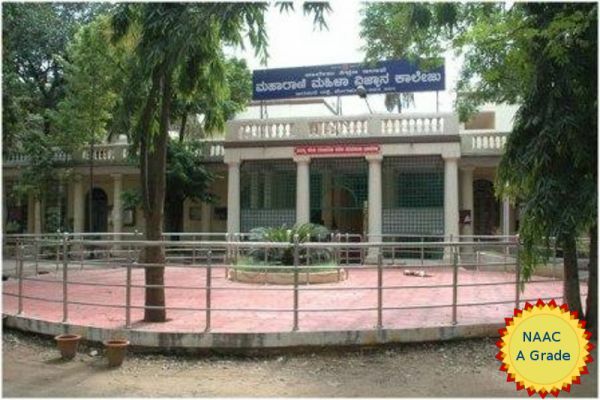 Maharani’s Science College for Women, Bangalore stands as a testimony to his glorious vision of providing science education exclusively to girls. The institution was started due to the benevolent initiative of the erstwhile Maharaja of Mysore, His Highness Sri NalvadiKrishnarajaWodeyar. The college with its aesthetically designed heritage building is ensconced amidst a sprawling campus of over11. 4 acres and is located in close proximity to VidhanaSoudha—the seat of power in the state. The college has earned recognition from various statutory bodies. The institution has obtained 2(f) and 12 (b) tag of the UGC and has been accredited by NAAC with a CGPS score of 2.78. The college is affiliated to Bangalore University and follows the semester program. Spanning the spotlight from fundamentals to applied aspects of major science subjects, the college offers B.Sc courses in fifteen combinations. In addition, the college also has PG courses in Microbiology, Biochemistry, Mathematics, Physics and Computer Application. Several of these subjects have interdisciplinary approach. Improving the employability skill set of students, the college offers Add-on courses in medicinal plants. A student stepping into the college has a wide range of course options to chose from - 16 combinations of subjects at undergraduate level, ranging from the basic sciences like Physics, Chemistry, Mathematics and Biology to focused areas like Bio-technology, Genetics and Computer Science. The college also offers postgraduate courses in Mathematics, Microbiology and Bio-technology. To make self-assessment both introspective and live the college obtains feedback from students about academics, extracurricular activities and campus experience through well designed feedback forms. An active counseling centre with 18 trained counselors addresses the academic and emotional issues of students. The mentor system enhances the feel good factor for the students and closely knits the students with the college. The Alumni Association s the old students with their alma mater. Regular parent teacher meetings are the bridges that connect all stakeholders. The total student strength of the college is 1100. The students come from across the prosperity spectrum ranging from underprivileged to wealthy sections. However the greater flux is from the former. To inculcate passion for perfection in academics, the college provides scholarships and endowment prizes. The Government’s initiative to waive off tuition fee and lab fee encourages students of economically constrained background to pursue higher education.